Census Citizenship Question: Supreme Court Refuses To Delay Trial The court has rejected a Trump administration request to postpone the first trial over the controversial question on the 2020 census. The trial is to start Nov. 5 in New York City. Commerce Secretary Wilbur Ross arrives at a U.S. Senate hearing in June. He added a citizenship question to the 2020 census that has sparked six lawsuits from dozens of states, cities and other groups that want it removed. The Supreme Court has refused to postpone the start of the first trial over the controversial citizenship question it added to the 2020 census. Released less than three days before the trial is set to begin in New York City, the high court's decision clears the path for the two lead lawsuits to move forward. The Supreme Court order notes that Justice Clarence Thomas, Justice Samuel Alito and Justice Neal Gorsuch dissented from the majority vote to reject the Trump administration's emergency request to delay the trial and let the cases go ahead. Kelly Laco — a spokesperson for the Justice Department, which is representing the administration — declined to comment on the Supreme Court order. Plaintiffs' attorneys at the New York state attorney general's office said they welcomed the justices' decision. "DOJ has tried every trick in the book (and then some) to block this case - and failed every time," wrote spokesperson Amy Spitalnick in an email. "You really have to wonder what they're trying to hide." More than two dozen states and cities, as well as other groups, are suing the administration to stop its plans to add the question. They have filed six lawsuits around the country. Potential trials for the cases in California and Maryland could start in January. In a court filing released Friday, attorneys for two of the California-based plaintiffs said they're planning to ask the judge hearing their case, U.S. District Judge Richard Seeborg, to skip holding a trial. That could speed up Seeborg's ruling, which — like all of the district court rulings for these lawsuits — is expected to be appealed all of the way to the Supreme Court regardless of which side wins. Opting for a partial summary judgment, however, means that Seeborg would only consider the internal documents initially released by the administration about the citizenship question to make his final ruling. Last week in New York, lower courts rejected earlier requests from the Justice Department to delay the trial expected to start on Nov. 5 in Manhattan. Postponing the trial, U.S. District Judge Jesse Furman wrote in his opinion, "could make a timely final decision next to impossible." It would have also ratcheted up the pressure this legal battle has put on preparations for the constitutionally mandated head count of every person living in the U.S. The Census Bureau has been waiting for a decision on the citizenship question to finalize the census form. Printing of the 2020 census forms is scheduled to begin in May. But in court filings submitted Monday, Solicitor General Noel Francisco argued that delaying the trial was necessary. The administration is still waiting for the Supreme Court to rule on its separate request to permanently block lower court orders allowing the plaintiffs' attorneys to question Commerce Secretary Wilbur Ross. Ross oversees the Census Bureau and approved adding the question. Last week, the high court put Ross' deposition temporarily on hold. The Justice Department is arguing that these lawsuits should be resolved based on the administration's initial record of internal documents about the citizenship question. Its attorneys want the Supreme Court to block earlier rulings that allowed testimony from Justice Department official John Gore and documents requested by the plaintiffs to be considered for the final ruling in these cases. Gore, who sat for questioning under oath last week, has led the Justice Department's civil rights division, which the administration argues needs the citizenship question to better enforce the Voting Rights Act. Francisco asked the Supreme Court for an "expedited" consideration of the Trump administration's requests. "All parties have an interest in speedy resolution of this case," the solicitor general wrote in one of the administration's court filings. Whether the citizenship question remains or is removed could have lasting impacts on how political power and federal funding are shared in the U.S. Population numbers from the once-a-decade head count will be used to divide up congressional seats and Electoral College votes — plus an estimated $800 billion annually in tax dollars — among the states. The citizenship question was added in March by Ross. The commerce secretary has said the Justice Department needs the question to better enforce the Voting Rights Act's protections against discrimination of racial and language minorities. Before announcing his decision to add the citizenship question in March, Ross testified during congressional hearings that the Justice Department "initiated" the request for the question and that he was "not aware" of any discussions about adding the question between the White House and him or his staff at the Commerce Department. Later, the administration filed documents with federal courts that backtrack Ross' testimony. 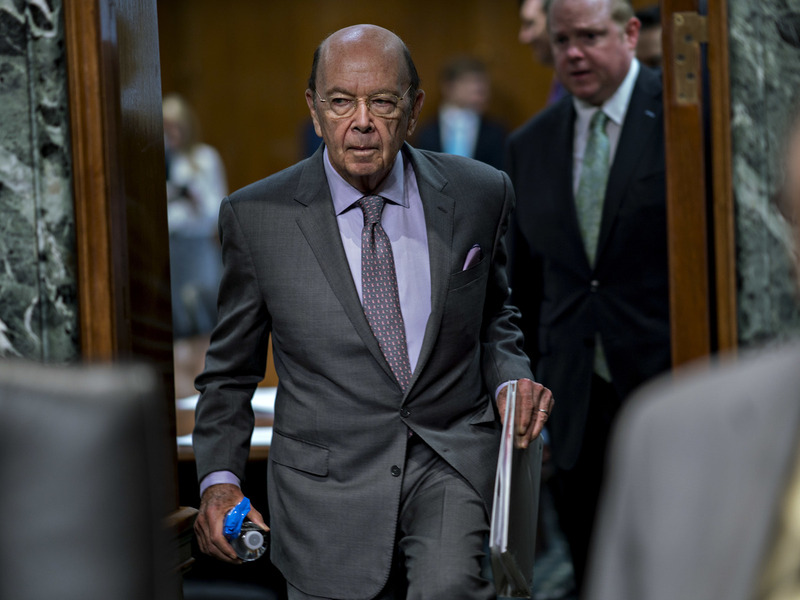 Internal memos, emails and other court filings released as part of the lawsuits make clear that Ross pushed to get the question onto the census shortly after his confirmation as the head of the Commerce Department in February 2017. This month, the administration's attorneys said Ross recently recalled that then-White House adviser Steve Bannon did contact him about the question in the spring of 2017. And earlier this year, Ross disclosed in a memo that his staff approached Justice Department staff to ask the DOJ to submit a request for a citizenship question. That attempt, an internal memo revealed, was initially rejected. The lawsuits' plaintiffs argue that Ross misused his discretion over the census and discriminated against immigrant communities of color by adding the question. They cite Census Bureau research that suggests asking about U.S. citizenship status could scare noncitizens from taking part in the census and harm the accuracy of the information collected. The plaintiffs also point out that Ross overruled warnings against the question from Census Bureau researchers, who urged the commerce secretary to choose an alternative method for generating citizenship data that would produce more accurate information and cost less money.